Magnetic reconnection: This view is a cross-section through four magnetic domains undergoing separator reconnection. Two separatrices (see text) divide space into four magnetic domains with a separator at the center of the figure. Field lines (and associated plasma) flow inward from above and below the separator, reconnect, and spring outward horizontally. A current sheet (as shown) may be present but is not required for reconnection to occur. This process is not well understood: once started, it proceeds many orders of magnitude faster than predicted by standard models. The evolution of magnetic reconnection during a solar flare. Magnetic reconnection is a physical process occurring in highly conducting plasmas in which the magnetic topology is rearranged and magnetic energy is converted to kinetic energy, thermal energy, and particle acceleration. Magnetic reconnection occurs on timescales intermediate between slow resistive diffusion of the magnetic field and fast Alfvénic timescales. The resistivity of the current layer allows magnetic flux from either side to diffuse through the current layer, cancelling outflux from the other side of the boundary. When this happens, the plasma is pulled out by magnetic tension along the direction of the magnetic field lines. The resulting drop in pressure pulls more plasma and magnetic flux into the central region, yielding a self-sustaining process. A current problem in plasma physics is that observed reconnection happens much faster than predicted by MHD in high Lundquist number plasmas (i.e. fast magnetic reconnection). Solar flares, for example, proceed 13-14 orders of magnitude faster than a naive calculation would suggest, and several orders of magnitude faster than current theoretical models that include turbulence and kinetic effects. One possible mechanism to explain the discrepancy is that the electromagnetic turbulence in the boundary layer is sufficiently strong to scatter electrons, raising the plasma's local resistivity. This would allow the magnetic flux to diffuse faster. A magnetic reconnection event on the sun. The qualitative description of the reconnection process is such that magnetic field lines from different magnetic domains (defined by the field line connectivity) are spliced to one another, changing their patterns of connectivity with respect to the sources. It is a violation of an approximate conservation law in plasma physics, called the Alfvén's Theorem, and can concentrate mechanical or magnetic energy in both space and time. Solar flares, the largest explosions in the Solar System, may involve the reconnection of large systems of magnetic flux on the Sun, releasing, in minutes, energy that has been stored in the magnetic field over a period of hours to days. Magnetic reconnection in Earth's magnetosphere is one of the mechanisms responsible for the aurora, and it is important to the science of controlled nuclear fusion because it is one mechanism preventing magnetic confinement of the fusion fuel. In an electrically conductive plasma, magnetic field lines are grouped into 'domains'— bundles of field lines that connect from a particular place to another particular place, and that are topologically distinct from other field lines nearby. This topology is approximately preserved even when the magnetic field itself is strongly distorted by the presence of variable currents or motion of magnetic sources, because effects that might otherwise change the magnetic topology instead induce eddy currents in the plasma; the eddy currents have the effect of canceling out the topological change. In two dimensions, the most common type of magnetic reconnection is separator reconnection, in which four separate magnetic domains exchange magnetic field lines. Domains in a magnetic plasma are separated by separatrix surfaces: curved surfaces in space that divide different bundles of flux. Field lines on one side of the separatrix all terminate at a particular magnetic pole, while field lines on the other side all terminate at a different pole of similar sign. Since each field line generally begins at a north magnetic pole and ends at a south magnetic pole, the most general way of dividing simple flux systems involves four domains separated by two separatrices: one separatrix surface divides the flux into two bundles, each of which shares a south pole, and the other separatrix surface divides the flux into two bundles, each of which shares a north pole. The intersection of the separatrices forms a separator, a single line that is at the boundary of the four separate domains. In separator reconnection, field lines enter the separator from two of the domains, and are spliced one to the other, exiting the separator in the other two domains (see the first figure). In three dimensions, the geometry of the field lines become more complicated than the two-dimensional case and it is possible for reconnection to occur in regions where a separator does not exist, but with the field lines connected by steep gradients. These regions are known as quasi-sepratrix layers (QSLs), and have been observed in theoretical configurations and solar flares. The first theoretical framework of magnetic reconnection was established by Peter Sweet and Eugene Parker at a conference in 1956. Sweet pointed out that by pushing two plasmas with oppositely directed magnetic fields together, resistive diffusion is able to occur on a length scale much shorter than a typical equilibrium length scale. Parker was in attendance at this conference and developed scaling relations for this model during his return travel. Sweet-Parker reconnection allows for reconnection rates much faster than global diffusion, but is not able to explain the fast reconnection rates observed in solar flares, the Earth's magnetosphere, and laboratory plasmas. Additionally, Sweet-Parker reconnection neglects three-dimensional effects, collisionless physics, time-dependent effects, viscosity, compressibility, and downstream pressure. Numerical simulations of two-dimensional magnetic reconnection typically show agreement with this model. Results from the Magnetic Reconnection Experiment (MRX) of collisional reconnection show agreement with a generalized Sweet-Parker model which incorporates compressibility, downstream pressure and anomalous resistivity. This expression allows for fast reconnection and is almost independent of the Lundquist number. Simulations of resistive MHD reconnection with uniform resistivity showed the development of elongated current sheets in agreement with the Sweet-Parker model rather than the Petschek model. When a localized anomalously large resistivity is used, however, Petschek reconnection can be realized in resistive MHD simulations. Because the use of an anomalous resistivity is only appropriate when the particle mean free path is large compared to the reconnection layer, it is likely that other collisionless effects become important before Petschek reconnection can be realized. , however, its effect, similar to the anomalous resistivity, is still too small compared with the observations. is the Alfvén velocity. This model has been successfully tested by numerical simulations. is the ion plasma frequency), ions decouple from electrons and the magnetic field becomes frozen into the electron fluid rather than the bulk plasma. On these scales, the Hall effect becomes important. Two-fluid simulations show the formation of an X-point geometry rather than the double Y-point geometry characteristic of resistive reconnection. The electrons are then accelerated to very high speeds by Whistler waves. Because the ions can move through a wider "bottleneck" near the current layer and because the electrons are moving much faster in Hall MHD than in standard MHD, reconnection may proceed more quickly. Two-fluid/collisionless reconnection is particularly important in the Earth's magnetosphere. Magnetic reconnection occurs during solar flares, coronal mass ejections, and many other events in the solar atmosphere. The observational evidence for solar flares includes observations of inflows/outflows, downflowing loops, and changes in the magnetic topology. In the past, observations of the solar atmosphere were done using remote imaging; consequently, the magnetic fields were inferred or extrapolated rather than observed directly. 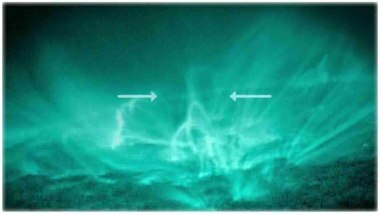 However, the first direct observations of solar magnetic reconnection were gathered in 2012 (and released in 2013) by the High Resolution Coronal Imager. Magnetic reconnection events that occur in the Earth's magnetosphere (in the dayside magnetopause and in the magnetotail) were observed by spacecrafts such as Cluster II and the Magnetospheric Multiscale Mission. Cluster II is a four-spacecraft mission, with the four spacecraft arranged in a tetrahedron to separate the spatial and temporal changes as the suite flies through space. It has observed numerous reconnection events in which the Earth's magnetic field reconnects with that of the Sun (i.e. the Interplanetary Magnetic Field). These include 'reverse reconnection' that causes sunward convection in the Earth's ionosphere near the polar cusps; 'dayside reconnection', which allows the transmission of particles and energy into the Earth's vicinity and 'tail reconnection', which causes auroral substorms by injecting particles deep into the magnetosphere and releasing the energy stored in the Earth's magnetotail. The Magnetospheric Multiscale Mission, launched on 13 March 2015, improved the spatial and temporal resolution of the Cluster II results by having a tighter constellation of spacecraft. This led to a better understanding of the behavior of the electrical currents in the electron diffusion region. On 26 February 2008, THEMIS probes were able to determine the triggering event for the onset of magnetospheric substorms. Two of the five probes, positioned approximately one third the distance to the Moon, measured events suggesting a magnetic reconnection event 96 seconds prior to Auroral intensification. Dr. Vassilis Angelopoulos of the University of California, Los Angeles, who is the principal investigator for the THEMIS mission, claimed, "Our data show clearly and for the first time that magnetic reconnection is the trigger.". Magnetic reconnection have also been observed in numerous laboratory experiments. For example, studies on the LArge Plasma Device (LAPD) at UCLA have observed and mapped quasi-sepratrix layers near the magnetic reconnection region of a two flux rope system, while experiments on the Magnetic Reconnection Experiment (MRX) at the Princeton Plasma Physics Laboratory (PPPL) have confirmed many aspects of magnetic reconnection, including the Sweet-Parker model in regimes where the model is applicable. The confinement of plasma in devices such as tokamaks, spherical tokamaks, and reversed field pinches requires the presence of closed magnetic flux surfaces. By changing the magnetic topology, magnetic reconnection degrades confinement by disrupting these closed flux surfaces, allowing the hot central plasma to mix with cooler plasma closer to the wall. ^ Priest, E. R.; Démoulin, P. (1995). "Three-dimensional magnetic reconnection without null points: 1. Basic theory of magnetic flipping". Journal of Geophysical Research. 100 (A12): 23443. Bibcode:1995JGR...10023443P. doi:10.1029/95ja02740. ISSN 0148-0227. ^ Titov, Vyacheslav S.; Hornig, Gunnar; Démoulin, Pascal (August 2002). "Theory of magnetic connectivity in the solar corona". Journal of Geophysical Research: Space Physics. 107 (A8): SSH&nbsp, 3&#45, 1–SSH&nbsp, 3&#45, 13. Bibcode:2002JGRA..107.1164T. doi:10.1029/2001ja000278. ISSN 0148-0227. ^ Mandrini, C. H.; Démoulin, P.; Van Driel-Gesztelyi, L.; Schmieder, B.; Cauzzi, G.; Hofmann, A. (September 1996). "3D magnetic reconnection at an X-ray bright point". Solar Physics. 168 (1): 115–133. Bibcode:1996SoPh..168..115M. doi:10.1007/bf00145829. ISSN 0038-0938. ^ Bagalá, L. G.; Mandrini, C. H.; Rovira, M. G.; Démoulin, P. (November 2000). "Magnetic reconnection: a common origin for flares and AR interconnecting arcs". Astronomy and Astrophysics. 363: 779. Bibcode:2000A&A...363..779B. ISSN 0004-6361. ^ Parker, E. N. (December 1957). "Sweet's mechanism for merging magnetic fields in conducting fluids". Journal of Geophysical Research. 62 (4): 509–520. Bibcode:1957JGR....62..509P. doi:10.1029/JZ062i004p00509. ^ Biskamp, D. (1986). "Magnetic reconnection via current sheets". Physics of Fluids. 29 (5): 1520. Bibcode:1986PhFl...29.1520B. doi:10.1063/1.865670. ISSN 0031-9171. ^ Ji, Hantao; Yamada, Masaaki; Hsu, Scott; Kulsrud, Russell; Carter, Troy; Zaharia, Sorin (26 April 1999). "Magnetic reconnection with Sweet-Parker characteristics in two-dimensional laboratory plasmas". Physics of Plasmas. 6 (5): 1743–1750. Bibcode:1999PhPl....6.1743J. doi:10.1063/1.873432. ISSN 1070-664X. ^ Ji, Hantao; Yamada, Masaaki; Hsu, Scott; Kulsrud, Russell (1998). "Experimental Test of the Sweet-Parker Model of Magnetic Reconnection". Physical Review Letters. 80 (15): 3256–3259. Bibcode:1998PhRvL..80.3256J. doi:10.1103/PhysRevLett.80.3256. ^ Parker, E. G. (1979). Cosmical Magnetic Fields. Oxford: Oxford University Press. ^ Lazarian, Alex; Vishniac, Ethan (1999). "Reconnection in a Weakly Stochastic Field". The Astrophysical Journal. 517 (2): 700–718. arXiv:astro-ph/9811037. Bibcode:1999ApJ...517..700L. doi:10.1086/307233. ^ Goldreich, P.; Sridhar, S. (1995). "Toward a theory of interstellar turbulence. 2: Strong alfvenic turbulence". The Astrophysical Journal. 438: 763. Bibcode:1995ApJ...438..763G. doi:10.1086/175121. ^ Kowal, G.; Lazarian, A.; Vishniac, E.; Otmianowska-Mazur, K. (2009). "NUMERICAL TESTS OF FAST RECONNECTION IN WEAKLY STOCHASTIC MAGNETIC FIELDS". The Astrophysical Journal. 700 (1): 63–85. arXiv:0903.2052. Bibcode:2009ApJ...700...63K. doi:10.1088/0004-637X/700/1/63. ^ Kowal, G; Lazarian, A.; Vishniac, E.; Otmianowska-Mazur, K. (2012). "Reconnection studies under different types of turbulence driving". Nonlinear Processes in Geophysics. 19 (2): 297–314. arXiv:1203.2971. Bibcode:2012NPGeo..19..297K. doi:10.5194/npg-19-297-2012. 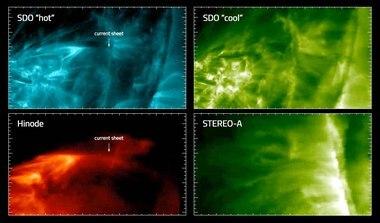 ^ "High-Resolution Coronal Imager Photographs the Sun in UV Light at 19.3nm Wavelength". AZonano.com. January 24, 2013. Retrieved February 9, 2013. ^ Burch, J. L.; Torbert, R. B.; Phan, T. D.; Chen, L.-J. ; Moore, T. E.; Ergun, R. E.; Eastwood, J. P.; Gershman, D. J.; Cassak, P. A. (2016-06-03). "Electron-scale measurements of magnetic reconnection in space". Science. 352 (6290): aaf2939. Bibcode:2016Sci...352.2939B. doi:10.1126/science.aaf2939. hdl:10044/1/32763. ISSN 0036-8075. PMID 27174677. ^ "THEMIS Satellites Discover What Triggers Eruptions of the Northern Lights". NASA. ^ Vassilis Angelopoulos (2008). "Tail Reconnection Triggering Substorm Onset". Science. 321 (5891): 931–935. Bibcode:2008Sci...321..931A. doi:10.1126/science.1160495. PMID 18653845. ^ "Secret of Colorful Auroras Revealed". Space.com. ^ Lawrence, Eric E.; Gekelman, W (2009). "Identification of a Quasiseparatrix Layer in a Reconnecting Laboratory Magnetoplasma". Physical Review Letters. 103 (10): 105002. Bibcode:2009PhRvL.103j5002L. doi:10.1103/PhysRevLett.103.105002. PMID 19792321. ^ Gekelman, W; Lawrence, E; Collette, A; Vincena, S; Compernolle, B Van; Pribyl, P; Berger, M; Campbell, J (2010-12-01). "Magnetic field line reconnection in the current systems of flux ropes and Alfvén waves". Physica Scripta. T142: 014032. Bibcode:2010PhST..142a4032G. doi:10.1088/0031-8949/2010/t142/014032. ISSN 0031-8949. ^ Ji, H.; et al. (May 1999). "Magnetic reconnection with Sweet-Parker characteristics in two-dimensional laboratory plasmas" (PDF). Physics of Plasmas. 6 (5): 1743–1750. Bibcode:1999PhPl....6.1743J. doi:10.1063/1.873432. Nasa MMS-SMART mission, The Magnetospheric Multiscale (MMS) mission, Solving Magnetospheric Acceleration, Reconnection, and Turbulence. Due for launch in 2014.